Now that the baby has arrived and been welcomed with a new blanket, I can post it for all to see. It's a 10 Stitch Blanket made in Loops and Threads Soft and Shiny yarn. The mostly red colourway is Fiesta and the other is Aqua. 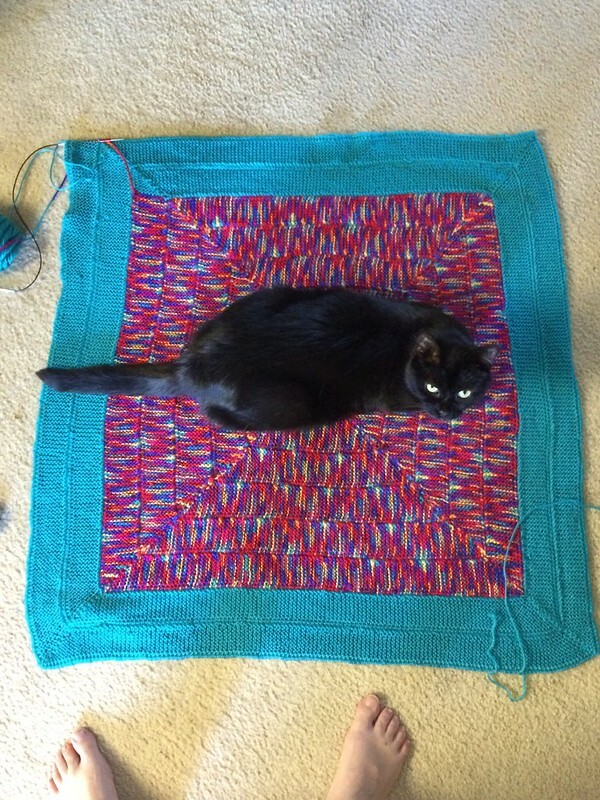 I had been aiming for a blanket that was 36" across. I wanted it a decent size so they could use it for more than a month. I finished a round and thought that it looked pretty close to that size. At this point it was taking me about a week to do one round. I laid it on the floor to measure and found that it was 32" across. I was waffling about doing another round and decided to have lunch and then look at it again. After lunch I checked my email and there was an announcement. Baby had arrived! At which point I called the blanket done , bound it off, wove in the ends, washed it and sent it off. When I laid it out on the floor to measure, the cat (of course) decided to check it out. The cat is about 9lbs, so I would say she's a decent stand in for a baby, right?